In the midst of a series of extremely cold windy days, the morning of our daylong retreat started with more of the same, but by the time the students arrived, the wind had quieted down, and by the end of the first sitting practice, the birds were singing, a sure sign of a calm day ahead. We were able to spend much of that mild sunny day doing walking and sitting practice in the garden. Being able to practice outside isn’t just pleasant; it provides a bounty of nature’s dharma lessons. The Buddha and his students practiced almost exclusively out of doors, even though there were undoubtedly followers who would happily have provided regular shelter. The retreat seemed to be timed perfectly since our last dharma talk had been about the Sense Spheres, and here we were with a full day to practice resting our awareness in the Sense Sphere portal. We had lots of things to smell, touch, taste, hear and see. Indoors I provided mint and basil clipped from the garden and set out on the counter to sniff, along with a bottle of vanilla. A student brought roses we put on the table, and there were more roses in the garden as well as a bounty of flowers, birds, trees, leaves, vistas, including the mountain. I encouraged them to do traditional walking meditations, but also to take time to use all the senses to experience the garden. So they reached out to touch, leaned in to smell, closed their eyes to listen. They became totally enmeshed in the life of the garden, noticing everything, and in that noticing the garden came more intensely to life. We noticed, among other things, how the bees buzzed with such joy in the trumpet vine flowers, the way the trees and the day lilies opened their arms wide to the sun, inspiring us to do the same. The way light danced in the long grasses, the happy song of the waterfall. The colors, the interplay of light and shadow. Yes, indeed, it is a ‘high’. But it is not induced by ingesting chemicals, but by pausing in our lives to simply be alive to our senses. And to sense ourselves as natural expressions of life as well. Resting awareness at the sense portals, we have the choice to be present or to get lost in all the patterns of associative thoughts, emotions, memories, judgments that the senses might trigger. We always have that choice, wherever we are. The dharma shows us the map of where we are in any given moment, and gives us the way to come home to our senses, again and again. 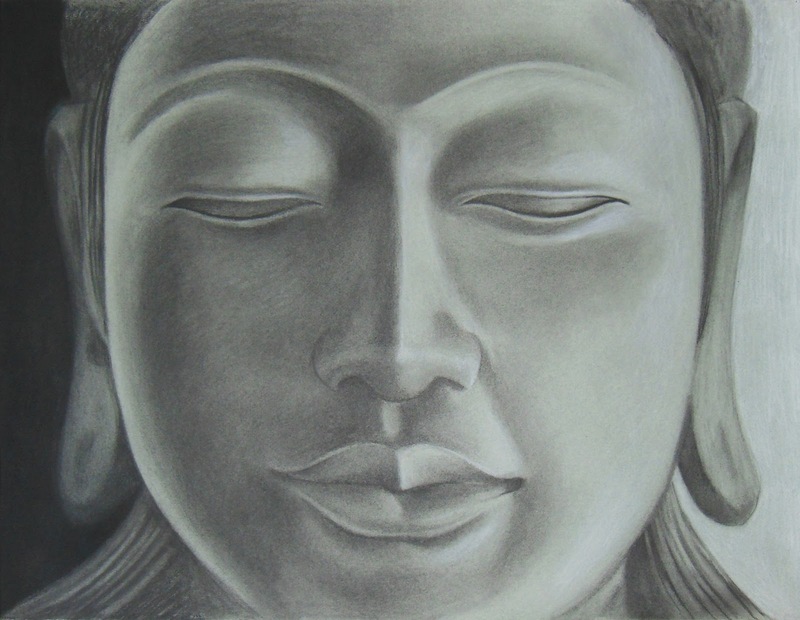 The next day was Vesak, the Buddhist celebration of the life of the Buddha, so I had created cards featuring a drawing of the Buddha by friend, artist and wise surfer Mary Wagstaff. Each retreatant received a card to write their insights and gratitude for the Buddha’s teachings. At the beginning of one meditation, I passed around a basket of shells and each person felt around and chose one to hold through the meditation, to rub the thumb against the rough or smooth surface when the mind wandered to bring them back to the present moment. Communing with the little shell in hand, the realization of oneness, of life formed of stardust, expressed in all its variations, but always kin, always the same at core. One student allowed the shell to take her to a sense of gentle lulling wave action in her meditation. At one point we lounged around in the studio and listened in silence to Missa Luba. This African choir sing a Catholic mass in their own language with such beauty. It was a perfect choice because the glory of the mass and the earthy drum beats, reminded us that the spirit of being is in the very pulse of the earth and our own bodies. Our aliveness is an expression of that spiritual nature. Towards the end, we came out of silence to share experiences in the garden communing with flowers, the view of the mountain, hummingbirds and the waterfall. Several reported momentary or extended periods of feeling one with everything. To help the students develop their own meditation practice at home, I led a short visualization exercise: Imagine your home. Imagine the place where you meditate or where you could meditate. It’s a quiet private place, etc. etc. Now imagine a time of day when you do or could easily meditate, etc. How do we find time in our busy lives for this kind of relaxed awareness practice? First we recognize it as a priority. We see how when we meditate it benefits the things we say we care about most: our health, our family and friends, and a sense of natural aliveness, not alienated or isolated. Then I used the same shells from the previous experience and took my bell bowl and began to fill it with all the tiny shells that represent all the little bits and pieces of life demands — emails, errands, obligations, hassles — they rattle around making a lot of noise and there’s no room for the big shell, that thing we say is so important: the practice that enables us to be healthy and loving. When I dumped the little shells out and put the big ones in first, they made no sound except to ring the bell on contact. Then I poured the little ones in, and they all fit right in, nice and snug, settling into the open spaces the big shells had created. A good lesson for us all. It is so easy to fill our time with the little things, putting off the big thing that matters, the big thing that would make all the little things so much easier to manage. So as I share this experience of a retreat with you, I hope there is inspiration to spend time resting your awareness at the sense portals when you take a walk or sit in nature. May you give yourself many opportunities to do so. May you establish a regular daily practice of meditation to develop a strong muscle of mindfulness. May you put that practice first so that all else will fall nicely into place in your life. And if the Buddha’s teachings have value for you, may you open to the gratitude for the Buddha, the dharma and the sangha. This entry was posted in Awake in the Wild, Four Foundations of Mindfulness, http://schemas.google.com/blogger/2008/kind#post, Mary Wagstaff, nature, retreat, Sense Spheres on May 26, 2013 by Stephanie Noble. Body — Initial contact with a sense object, for example: a sound. Feeling Tone – We have an immediate feeling tone response to the sound. It’s either pleasant, unpleasant or neutral. A pleasant ‘What lovely bird song!” or an unpleasant “What an irritating leaf blower!” or a neutral soft thud of a car door closing, that might not even register. Cognition – We identify or work hard at trying to identify the source of the sound. “What kind of bird is that?” Now if you’re a birder, you might go on to, “I should know that.” If you’re not but think you’d like to be, you might think ‘I should take that class on bird song’ and suddenly your mind has taken you to the local community college, and then you think about how you could go on one of those birding field trips. And suddenly you’re in an Amazon jungle, binoculars in hand staring up into the tangle of vines and leaves. Your mind itself has become a jungle. Then it goes into association that takes us on an extended journey into the past and the future: “I should probably call someone to check out our trees. That one oak has a branch that really looks iffy. I was really afraid in the last storm. Boy that was a rough night.” “I wouldn’t want it to fall on the house. God, what if it fell on the house when the grandchildren were napping in the guest room.” And on, and on in a flurry of memories, planning or fantasy. Volition – Perhaps we decide to go do something about the sound: If it’s unpleasant we might put our hands over our ears, close the door, or get away from the sound. If it’s pleasant we might move closer to the sound, or we might move our bodies to the delightful rhythms of the sound, or investigate it further to see what the sound is. Consciousness – At some point we become aware that we are lost in thought. We don’t decide to think all these thoughts. The thoughts, projections and associations proliferate quickly into a densely woven network, and we are as helplessly trapped as a fly in a spider web. So there’s no point in beating ourselves up about having been lost. And doing so is just another tangle of thoughts we immediately get lost in. That’s why compassion is so important. The moment we are aware that we have been thinking is cause for celebration, not punishment. We are here now in this moment. Ah. How do we untangle ourselves from the web of thought? That’s an almost impossible challenge since we are not aware that we are trapped and don’t see it as a problem until suddenly we do. Wouldn’t it be easier and wiser to learn to recognize how the web arises in the mind and how to not get drawn into it? That’s what we do with mindfulness practice. We slow down enough to see how the process works. We set the intention to be with the sensory experience itself, to let a sound be a sound, a smell be a smell, etc. and to be sufficiently aware not launch into subjective mental activity that takes us out of the present moment. Woof! In class we talked about the value of treating the wandering mind like an excited and untrained puppy. This helps us to hold it with the right amount of loving kindness and intention to train it well. We have the puppy-mind on a leash but at first the leash is so long the puppy wanders far and wide. As we learn to hold the leash — learn to anchor our awareness in physical sensation — the puppy may begin to wander but doesn’t go very far before we gently pull the leash. So in the example above of the mind following a sound all the way to the Amazon, with training maybe it only gets as far as the local community college. With more mindfulness practice, eventually a sound is just noted as sound. Symphony of Silence Perhaps you are familiar with the work of John Cage who famously composed and presented a piece titled 4’33 which he performed to a packed symphony hall. It consisted of four minutes and 33 seconds of silence on his part, allowing the sounds of the audience be the symphony. As originally performed it is reported that the audience had a lot of response, was made uncomfortable, and there was a lot to listen to. I just checked several YouTube versions of recently performed versions of 4’33, and the audience was almost completely silent! What a rich silence comes from hundreds of people sitting together paying close attention to one focus, a man with a piano and a timer, or a conductor with an orchestra and a timer, all in silence, but not waiting for anything. So John Cage taught us something hugely important. Can we incorporate it into our own practice? The willingness to be present for whatever arises without needing it to be more than simply noting ‘sound’ or one of the other sense objects. That is our mindfulness practice. This entry was posted in five aggregates, http://schemas.google.com/blogger/2008/kind#post, John Cage, mindfulness, Sense Spheres on May 19, 2013 by Stephanie Noble.